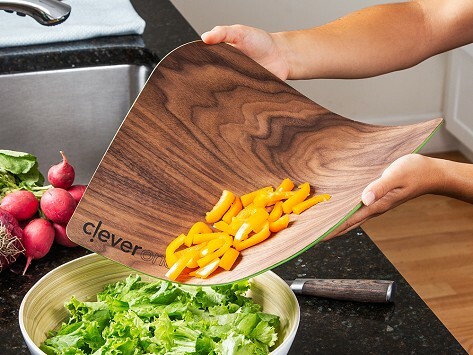 Cut and transfer ingredients with a flexible cutting board. The natural wood cutting surface is backed by food-grade silicone that lends grip and bendability and adds a protective layer to your countertop. It's made in Wisconsin from North Carolina hardwood and easy to to wash and store when the food prep work is done. Dimensions: 11" x 14" x 0.13"
Gave this as a gift! It was well liked! And put right to use! Clever item! I LOVE THEM SO MUCH! ALSO IT IS SO EASY TO WASH THEM AND PUT THEM IN THE DRAWER! woodNflex is the best of both types of cutting boards. It’s a flexible cutting board that pairs a real wood cutting surface with a silicone backing that lends grip and bendability. The board is flexible enough so you can better transfer and pour ingredients and it also acts as a protective (but low-profile) surface on your countertop. It’s lightweight and super thin, so clean-up and storing it is easy, too. Makers Corey Canfield and Matt Abbondanzio share a background in kitchen wares and created WoodNFlex to solve a complaint they kept hearing: that home cooks love cutting on wooden cutting boards but often found them too cumbersome. Their bendable take is made in Wisconsin from natural hardwood sourced from North Carolina and perfectly balances the look and feel of wood with the ease of silicone.